A core characteristic of the tumor microenvironment, hypoxia is present in all solid tumors and has been proposed to also influence liquid cancers [3, 5, 6, 7, 8]. Although tumors are vascularized, rapid angiogenesis results in the formation of an ineffective and leaky vascular network often containing dead ends . While the exterior cells of the tumor mass are more likely to receive sufficient oxygen, the core of the tumor lacks oxygen and generally displays areas of severe chronic hypoxia . Hypoxic regions are not limited to the tumor core, and can occur throughout the mass even in close proximity to what histologically appears to be a functional blood vessel, suggesting that demand-to-supply imbalance contributes to hypoxic microenvironments . Hypoxic tumor cells can survive due to changes in cellular processes partially mediated by the accumulation and activity of hypoxia-inducible factors (HIFs). Data support the hypothesis that chemotherapy and radiation resistance seen in cancers are at least partially due to increased HIF activity [11, 12, 13, 14]. Hence, tumorigenesis may be inhibited by blocking HIF activity in these hypoxic cells, making HIFs an attractive target for treating some cancers [15, 16, 17, 18, 19]. HIFs are well-known as transcription factors. However, their role in mRNA-to-protein translation is also imperative to cell survival since the canonical protein synthesis pathway is impaired in hypoxia. Structurally, HIF1α and HIF2α are highly homologous, containing the same motifs and domains. They both contain basic-helix-loop-helix (bHLH) and Per-Arnt-Sim (PAS) domains, which are required for DNA-binding and heterodimerization with ARNT in response to hypoxia, respectively . HIF1α and HIF2α also contain transcriptional activation domains at the N-terminus (N-TAD) and the C-terminus (C-TAD) that are required to activate transcription of hypoxia-inducible genes and are subject to regulation by hydroxylation in normoxia . The most differences in structure of the two isoforms are within the N-TAD region. The N-TAD is responsible for recognizing transcriptional target genes and due to the differences found in the N-TAD between HIF1α and HIF2α, these proteins may target sets of different genes . These two subtypes also contain an oxygen-dependent degradation domain (ODDD), required for regulation by oxygen-dependent proteins that degrade the HIFs in normoxia [30, 31, 32]. Like the HIFα subunits, the ARNT subunit contains bHLH and PAS domains. However, it does not contain the N-TAD region or the ODD domain, suggesting its oxygen-independent expression. ARNT is a nuclear translocator involved in many different cellular processes that aid protein translocation from the cytosol or the nuclear membrane into the nucleus. Hence, ARNT is ubiquitously and constitutively expressed. It is involved in cancer progression, chemotherapy resistance, wound healing and immune response pathophysiology [37, 38, 39, 40]. One of the major HIF regulatory proteins is HIF-prolyl hydroxylase 2 (HIF-PH2) that belongs to the prolyl hydroxylase domain enzyme (PHD) family. PHDs are a major oxygen-sensing protein family that, upon binding to oxygen, hydroxylates different target protein to initiate a cellular response. HIF-PHD hydroxylates HIFs at proline residues (pro402 and pro564 in HIF1α, pro405 and pro531 in HIF2α, pro492 in HIF3α) in the HIF ODDD [45, 46, 47, 48]. These modifications facilitate the recruitment of von Hippel-Lindau ubiquitin ligase complex (pVHL-E3 ligase complex) that ubiquitinates HIFα, promoting proteasomal degradation . As hypoxic exposure progresses, nitric oxide (NO) levels also increase, leading to HIFα S-nitrosylation. HIF1α is S-nitrosylated at cysteine residues cys520 and cys800. S-nitrosylation at cys520, which lies within the ODD domain of HIF1α, increases the stability of the protein and impairs degradation by blocking prolyl hydroxylation and preventing ubiquitination. S-nitrosylation of residue cys800 promotes HIF1α binding to transcriptional co-factors, such as p300 and CBP, ultimately enhancing its transcriptional activity [55, 56, 57]. 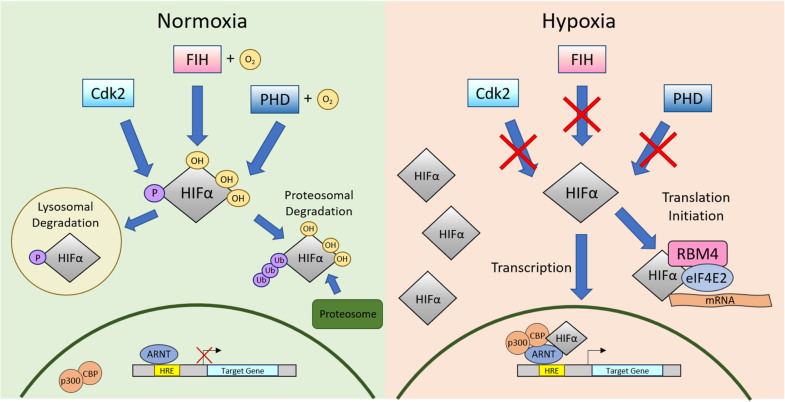 Additionally, HIFα transcriptional activity is inhibited in normoxia by an asparagine hydroxylase, factor-inhibiting hypoxia-inducible factor (FIH). FIH catalyzes HIFα (asp803) hydroxylation in the C-TAD, the binding sites of co-transactivators p300/CBP that promote transcription of HIF target genes . Hydroxylation of C-TAD prevents p300/CBP co-activators from binding to HIFs, ultimately blocking hypoxia-response element promoter binding [59, 60]. Because HIF-PHD and FIH use oxygen as co-substrates to hydroxylate HIFs, hydroxylation cannot occur in hypoxia, causing HIF stabilization and accumulation. HIFs can translocate to the nucleus to initiate transcription or can remain in the cytoplasm to initiate translation of hypoxia-responsive proteins (Fig. 2) [3, 61]. Ineffective or faltered HIF regulation by PHDs or FIH may lead to cancer [62, 63, 64, 65]. 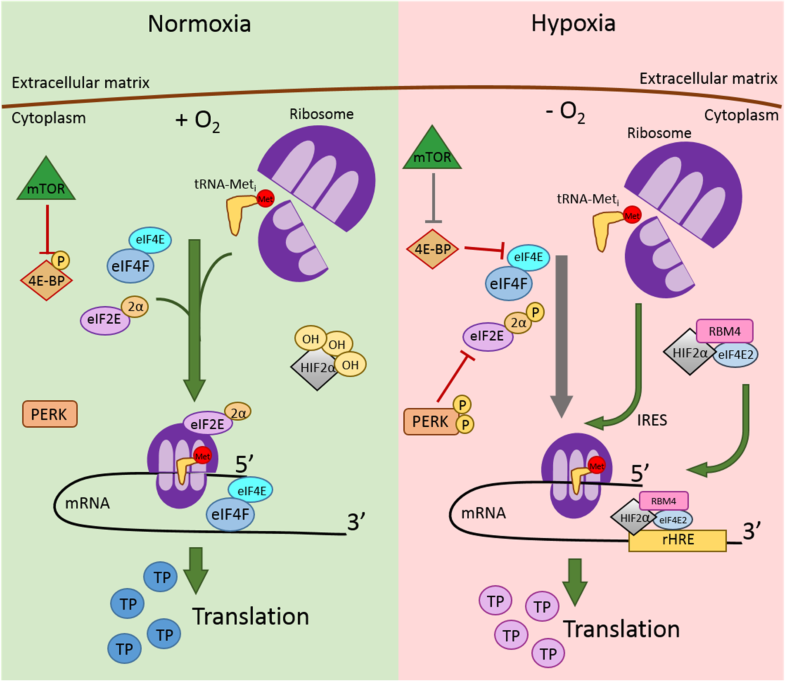 In addition to these methods of HIFα regulation by other proteins, non-coding RNAs also play an important role in mediating cellular response to hypoxia. One of the most well-elucidated non-coding RNAs in hypoxia are micro-RNA-429 (miRNA-429) and micro-RNA-210 (miRNA-210), which has been shown to create a negative feedback look with HIF1α [67, 68]. These two miRNAs have been shown to directly bind to the 3′ UTR of the HIF1α gene, ultimately decreasing the expression of HIF1α. Interestingly, these miRNAs are also the target genes of HIF1α, creating a negative feedback look of HIF1α expression in hypoxia. HIFs are also regulated by hypoxia-responsive long non-coding RNA (HRL) [69, 70]. HRLs have a variety of functions in hypoxic cancers as they have been associated with increased tumorigenesis, ionizing radiation therapy resistance and metastasis [69, 70, 71]. HRLs are transcriptional targets of HIFs and unlike miRNAs, HRLs create a positive feedback by stabilizing HIFs by disrupting the HIF-VHL interaction, thus resulting in HIF accumulation . Hypoxic protein synthesis is geared towards adaptation that is initiated through mechanisms of mRNA selection for translation. There are several proposed mechanisms that contribute to mRNA selectivity in hypoxia: upstream open-reading frame (uORF)-mediated mRNA regulation, endoplasmic reticulum-mediated mRNA selection, IRES-dependent translation initiation and the presence of ribosomal hypoxia-response elements (rHRE) in the mRNA recognized by the hypoxic translation machinery [73, 74, 75, 76, 77]. uORFs are short sequences that lie within the 5′ UTR region upstream of the protein coding sequence start codon, also called the main open-reading frame (mORF). The uORF is an essential cis-acting translation regulatory component that interacts with proteins that promote mORF translation or interacts directly with the ribosome, ultimately preventing mORF translation [78, 79]. Some 40–50% of all human mRNA transcripts contain at least one uORF that regulates mORF translation . uORF regulation can decrease protein expression by 30 to 80% of its expression in normoxia . In hypoxia, uORFs regulate HIF-mediated gene expression changes by allowing the scanning ribosome to bypass the uORF start codon, uAUG, allowing for mAUG recognition and mORF translation . Translation of some mRNAs, such as EPO, GADD34 and VEGF, rely on the presence of uORFs to activate translation distinctly in hypoxia and not as significantly in normoxia [77, 81, 82, 83]. In parallel to PIC formation in normoxia, the mRNA translation is activated by eIF4E binding. eIF4E is a protein in the eIF4F complex that recognizes and binds to the 7-methyl-guanine cap structure at the 5′ end of the mRNA . The eIF4F complex also consists of eIF4A and eIF4G proteins which remove mRNA secondary structures to allow for more conducive PIC binding to the 5′ end of the mRNA. eIF4G also binds to a poly-(A) binding protein (PABP), which associates with the 3′ poly-adenylated mRNA tail end. This was initially thought to cause the mRNA to fold into a loop structure [101, 102, 103]. However, recent research show that few mRNAs actually form this “closed-loop structure”; rather, mRNA bound to the eIF4F complex and not PABP form the loop structure, while mRNA bound to PABP, which consist of most mRNAs, do not [104, 105]. Further elucidation regarding the use of the “closed-loop structure” of mRNA in translation will be necessary. The eIF4F complex recruits the pre-assembled PIC to the 5′ end of the mRNA, forming the 48S ribosome-mRNA complex . PIC scans the mRNA from the 5′ end to the 3′ end until the met-tRNAi identifies and binds to the AUG start codon. Met-tRNAi binding to the start codon causes eIF2 hydroxylation, which releases eIF proteins from the 48S complex and promotes the binding of the 60S large ribosome subunit to initiate translation elongation . eEF2K activity is regulated by the binding of calcium/calmodulin complex and by proline hydroxylation. Under cell stress, the interaction between eEF2K and calcium/calmodulin facilitates eEF2K(thr348) autophosphorylation. The activated eEF2K then phosphorylates eEF2(thr56), inactivating the elongation factor and inhibiting translation elongation. It was initially believed that mTORC1 was the sole regulator of eEF2K in hypoxia that resulted in translation elongation downregulation . However, eEF2K is also regulated by prolyl hydroxylation by prolyl hydroxylase 2 (PH2), a member of the PHD enzyme family . In normoxia, PH2 uses oxygen as a co-substrate to hydroxylate eEF2K(pro98), preventing protein activation. This allows for eEF2 to remain unphosphorylated allowing translation elongation. In hypoxia, however, PH2 activity in eEF2K regulation is impaired due to the lack of oxygen co-substrate, allowing eEF2K to bind to calcium/calmodulin and leading to eEF2 phosphorylation and inactivation, decreasing the rate of global protein synthesis [113, 115, 116, 117, 118, 119]. 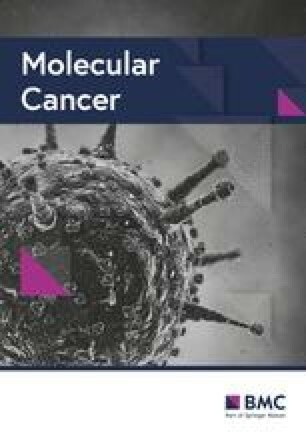 While prodrugs may seem promising, the use of small molecules to target hypoxic cancer cells nevertheless appears to be effective. For example, the use of topotecan and other topoisomerase I inhibitors have been used to treat cancers in the clinic. The effect that topotecan has on hypoxia has been studied in clinical trials . In 2011, the inhibitory effects of topotecan on HIF1α activity were evaluated in 22 patients . Topotecan inhibits HIF1α by a mechanism independent of its role in DNA replication [133, 134, 135]. However, results showed no exclusive correlation between HIF target gene expression and topotecan treatment in patient cancer cells. While HIF expression and activity decreased in patients treated with topotecan, the expression of the HIF target gene VEGF was unchanged . The results of this study did not suggest topotecan as a HIF-targeting cancer therapeutic due to its short plasma half-life of ~ 3 h, lack of HIF specificity and high toxicity [133, 136]. In 2016, the idea of using a nanoparticle conjugate CRLX101 with the administration of an anti-angiogenesis antibody bevacizumab to target hypoxic cancer cells was explored in a Phase I clinical trial . The CRLX101 nanoparticle-drug conjugate is infused with a topotecan analog camptothecin, another topoisomerase I inhibitor. Camptothecin decreases HIF protein transcription, effectively decreasing its activity in hypoxic cells . The reasons for using nanoparticle-drug conjugate to deliver camptothecin is two-fold. First, nanoparticles appear to preferentially aggregate into tumor cells, allowing for increased specificity in targeting cancer cells . Second, the nanoparticle conjugate allows for a slow release of the infused camptothecin, significantly increasing the half-life of the drug . Camptothecin also displays less toxicity compared to topotecan and is better tolerated by patients. The nanoparticle-drug conjugate CRLX101 is currently in several preclinical studies and Phase I and Phase II clinical trials for the treatment of gastroesophageal cancer, advanced renal cell carcinoma and breast cancer [138, 139, 140, 141]. The effect that camptothecin has on hypoxic protein synthesis has not yet been studied. Another method of targeting hypoxic cancer cells is by inhibiting eIF4E2 activity. eIF4E2 is active only in hypoxia and complexes with HIF2α/RBM4 to initiate the first step of hypoxic translation . By inhibiting eIF4E2, and consequently inhibiting hypoxic protein synthesis, cancer cells can be distinctively targeted from healthy cells by inhibiting the hypoxic protein synthesis pathway. Evidence suggests that eIF4E2 suppression significantly slows or even reverses cancer growth . While an eIF4E2 targeting drug has immense potential as a cancer therapy, there has been difficulty finding a compound that can distinctively target eIF4E2 over eIF4E. There are currently therapies targeting eIF4E, such as the use of antisense oligonucleotides and small molecule inhibitors that block eIF4E complexing with eIF4G [144, 145, 146]. However, because these targeting methods cannot effectively distinguish eIF4E2 from eIF4E, healthy cells that utilize the cap-dependent translation initiation will also become the target of these therapies. Therefore, there is still a need to identify a cancer therapy that specifically targets eIF4E2 to inhibit protein synthesis in hypoxic cancer cells.